As the saga of in-app purchasing within children’s apps continues, we are seeing success story after success story about companies who are donning their moral hats and doing the right thing by removing in-app purchasing capabilities from their educational apps. Timbuktu, a super cute educational app that was also the portrait of poorly thought out in-app purchasing, is next in a string of companies who are re-thinking their business model and are subsequently putting a stop to ‘freemium’ abuse. 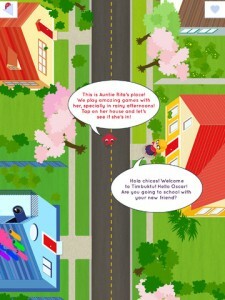 Timbuktu is a creative kid’s app that is beautifully illustrated and offers children a “magazine-like” experience which has slowly evolved into a kind of and idea board that allows children and parents to do all sorts of activities together, such as printable worksheets and cute craft ideas. Prior to their recent change, Timbuktu sported a lot of in-app purchasing opportunities. While this wasn’t necessarily out of the ordinary, their purchasing process was anything but the usual. In a seemingly random fashion, there were days when the content on Timbuktu would be free to use. On other days, payment was required to access certain content. Instead of prompting parents (or more that likely, children) to purchase this content with a ‘buy now’ or ‘confirm purchase’ button, users were encouraged to ‘pop virtual bubbles’ to purchase content. Um, what? It is beyond clear that this type of interaction could be easily mistaken for part of the game by a small child (or, let’s be real here, even an adult). Now Timbuktu, likely because of feedback received about their poorly thought out in-app purchases, is rethinking their entire business model. With the new changes in place, adults can now subscribe to the entire Timbuktu app for around $30 per year, and the process doesn’t involve even one bubble. The purchasing opportunities have been removed from the children’s portion of the app and have been walled-off in an adult section in an effort to cut down on accidental purchases. Hi guys, thanks for featuring us. Please, note that we didn’t “donn our moral hats”, at least not now. In fact, as soon as we understood it was hard for kids to understand bubbles were a virtual currency, we kept the app *completely* free for more than 3 months (out of the 5 the app was live). We’re pleased – of course – that the new model had such amazing feedback, but it’s kind of crazy to be depicted as greedy developers who had redemption. 🙂 Trust and respect are (and have always been) fundamental values at Timbuktu. Thanks a lot for giving us the opportunity to explain this. Thank you for the clarification! We wanted to feature your current in-app purchasing process to highlight the changes being made as a response to growing concern about costly IAPs across the board. Please know that our intent was to highlight the end result of the “new” Timbuktu app and emphasize the positive forward motion happening in the kids’ app community.